Research guide for Harvard Law School's research program on international humanitarian law and the law of armed conflict. This is a research guide for the Harvard Law School Program on International Law and Armed Conflict (PILAC). It provides information about helpful resources for the program's research and work. Research Librarian Jennifer Allison, who is the Harvard Law Library's PILAC liaison, created and maintains this guide. Click the PDF icon above to access the PowerPoint from Jennifer's training class on October 20, 2014. For help, visit the HLSL Ask a Librarian website: http://asklib.law.harvard.edu. This site includes links to all of our research guides, contact information for the research librarians (phone, text, email, chat), and a schedule of our training classes. This section discusses guiding principles with which PILAC is concerned. It provides definitions, quick links to web resources and articles, and references to books that provide more in-depth discussions of the topics. International Humanitarian Law (IHL) creates legal restrictions on waging warfare for the purpose of protecting non-participants. It is comprised of international treaties and customary law. Jus in Bello is the body of legal norms that regulate the conduct of participants in armed conflict. The International Committee of the Red Cross (ICRC) provides humanitarian protection of and assistance to people impacted by war and armed conflict. In addition to its work on the ground, the ICRC also provides resources for IHL research. "International Humanitarian Law is a set of rules which seek, for humanitarian reasons, to limit the effects of armed conflict. It protects persons who are not or are no longer participating in the hostilities and restricts the means and methods of warfare." Treaties are organized by date, topic, and state. This database includes rules and practice of customary IHL. This is the Harvard Law Library's separate research guide on International Humanitarian Law. Brief, yet comprehensive, list of resources that are helpful for IHL research. Judge Christopher Greenwood of the International Court of Justice provides a brief discussion of how international law has, throughout its history, attempted to preserve humanity in warfare. This source discusses treaties and international customary law; the main treaties on international humanitarian law (IHL); problems of ratification of IHL treaties; reservations to IHL treaties; legal relationships between IHL treaties; interpretation of IHL treaties; special agreements; denunciation of IHL treaties; and the legal effects of a breach of an IHL treaty. Includes a brief overview of IHL, bibliographies of important and recent titles, and a blog. Daniel Bethlehem, Cambridge Journal of International and Comparative Law, 2013. Jus ad Bellum governs the pre-engagement conduct of states and non-state actors that are considering whether to engage in war and armed conflict. It is concerned with the justification of and limits to the use of force. Jus in Bello is the body of legal norms governing battle and occupation - the "conduct of individuals and units toward combatants, non-combatants, property, and the environment." Violations are punishable under customary international law and international legal instruments. In scholarly literature, Jus ad Bellum and Jus in Bello are often discussed together. They may be discussed under broader philosophical, religious, or moral principles using the terms Just War Theory or Just War Doctrine (Jus Bellum Iustum). Sometimes these are discussed in combination with a third principle, Jus Post Bellum, which encompasses post-conflict legal norms. Discusses military manuals of the UK, Canada, Germany, and Switzerland. Short explanation of the principles of Jus ad Bellum and Jus in Bello from the Crimes of War online reference project. This chapter focuses on proportionality as a device in international law and as an alternative model of law-making. It first discusses proportionality as a form of legal control in armed conflict, the notion of proportionality in humanitarian law (ius in bello), by itself and in its relations with the law governing the resort to the use of armed force (ius ad bellum). It then analyses the structure and content of proportionality in ius in bello and in ius ad bellum, how proportionality is applied in the treatment of civilians, and the structure of the proportionality assessment in symmetrical and asymmetrical legal relations. Article on war from the Stanford Encyclopedia of Philosophy; includes a discussion of just war theory, Jus ad Bellum, Jus in Bello, and Jus post Bellum. 2015 treatise edited by Andrew Clapham et al. Available as an eBook and in print. ICRC's short overview of the Geneva Conventions, which establish regulations and limits in the conduct of armed conflict. From the series Nijhoff Classics in International Law; commentary by Michael Bothe. Available in print and as a eBook. 17-volume set of records of the meetings in which the protocols to the Geneva Conventions were developed. To view the current text of the Geneva Conventions and Protocols, click the link above and select Geneva Conventions (with Protocols) in the popular name list. Use the Harvard Libraries' HOLLIS library catalog to search for books, book chapters, articles (from scholarly journals to newspapers and magazines), internet sources, and other types of materials in the Harvard Libraries' collections. Always sign in with your HUID credentials to save your searches and search results. If you are off campus, this will ensure you see everything, including subscription database content. Limit your search results using the options on the right side of the search results screen. Use the Advanced Search option to search specific data fields, including title, author, Library of Congress subject heading, ISBN, and others. Questions about using HOLLIS? Check out the Hollis FAQs and Quick Tips, or contact the law library's research librarians. Library of Congress (LC) subject headings are a controlled vocabulary of subjects used by the Harvard Library catalogers to categorize library materials. They can be useful for finding multiple sources on the same topic, especially sources in languages other than English, where keywords may not be sufficiently precise. The Library of Congress has a very helpful and brief explanation of how to search a library catalog using LC subject headings. In addition to outlining the principles of subject headings, it offers four excellent suggestions for finding the appropriate subject headings for your search. Throughout this guide, there are links to pre-populated searches of HOLLIS, the online catalog of the Harvard Libraries, using relevant LC subject heading keywords. The International Committee of the Red Cross (ICRC) publishes a bibliography every quarter. It lists references to English and French publications on international humanitarian law, and is based on books and other material in the ICRC library. Use this resource to browse the most recent IHL topics. The books listed below provide a general introduction to the law of war and armed conflict. Compilation of leading articles on international law topics; volume 5 focuses specifically on the law of war. Some publishers offer series of works that discuss topics relevant to war, armed conflict, and international humanitarian law research. Click a series link below to view a list of the series titles in the Harvard Libraries collection. Masters theses and PhD dissertations provide book-length information on topics of interest to PILAC and bibliographies of relevant research materials. Central, open-access repository of research by members of the Harvard community. A central portal for searching and locating Electronic Theses and Disseratations (ETDs) from universities around the world. Search engine for finding open access graduate theses and dissertations published around the world. Includes citations for dissertations and theses from around the world, ranging from 1861 to those accepted last semester. Abstracts and full-text access are available for more recent works. Harvard affiliates can click the journal titles below for information about print and electronic access to them. Journal website links are also provided; some include free content. The Armed Conflict Survey provides in-depth analysis of the political, military and humanitarian dimensions of all major armed conflicts, as well as data on fatalities, refugees and internally displaced persons. Published by the Peace Science Society (International) at Penn State University. U.S. Naval War College journal with articles on armed conflict law, international humanitarian law, asymmetric warfare, combating terrorists and other non-state actors, and others. Published quarterly by the ICRC. 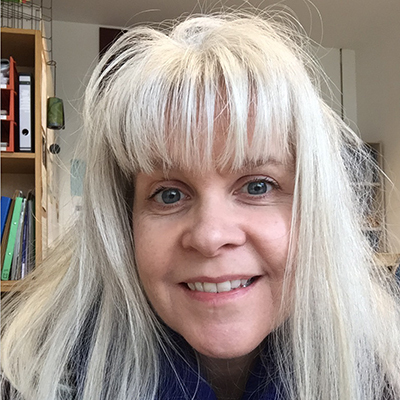 Peer-reviewed journal published by Brill. International, peer-reviewed journal devoted to normative aspects of military force. Published by the Peace Research Institute Oslo (PRIO). Published by the Group for War and Culture Studies at the University of Westminster. Peer reviewed journal covering all aspects of the law governing the use of force (jus ad bellum). Published under the auspices of the International Society for Military Law and the Law of War. Open-access journal; founded and maintained by the Terrorism Research Initiative (terrorism studies research consortium headquartered at UMass Lowell). Yearly publication by Oxford University Press reporting on armed conflicts around the world, initially published in 2012.
International forum for peer-reviewed articles on IHL published by the Cambridge University Press. To find additional journals not listed in this guide, try searching these journal directories. This section of the guide presents topic-specific materials for PILAC research projects. In general, only recent (post-2010) materials are included. These will cite older seminal works, so review their citations and references carefully. When possible, links are to final published articles (not drafts or working versions). HOLLIS search: Subject = "Asymmetric Warfare"
HOLLIS search: Subject = "Counterinsurgency"
HOLLIS search: Subject = "Irregular Warfare"
Irregular Warfare: Annotated Bibliography by Paul J. Thompkins, Jr.
Asymmetric Warfare: How to Respond? Wolff Heintschel von Heinegg, International Legal Studies Series, U.S. Naval War College (2011). Jens David Ohlin, Yale Journal of International Law, Summer 2015. Eyal Benvenisti, Duke Journal of Comparative and International Law (2010). Samuel Estreicher, Chicago Journal of International Law (2011). Samuel Estreicher, Chicago Journal of International Law (2012). HOLLIS search: Subject = "Military Occupation"
Eyal Benvenisti, Law and History Review (2008). Adam Roberts, American Journal of International Law (2006). Kenneth Watkin, International Review of the Red Cross (March 2012). According to the ICRC, in modern combat, "[c]ivilians have been increasingly involved in activities more closely related to the conduct of hostilities, thus blurring the distinction between civilian and military functions. This has created uncertainty as to how the principle of distinction, the very cornerstone of IHL, should be implemented in the reality of contemporary military operations." For more information on this topic, see the ICRC's Direct Participation in Hostilities homepage. HOLLIS search: Subject = "Combatants and Noncombatants (International Law)"
Journal of International Humanitarian Legal Studies, v. 3, 2012. Text of a lecture by Yoram Dinstein, Tilburg Law Review (2013). David J.R. Frakt, Valparaiso University Law Review, v. 46 (2012). Michael N. Schmitt and Andre E. Wall, Harvard National Security Journal (2014). 2009 publication of the International Committee of the Red Cross. Anton O. Petrov, Journal of Conflict and Security Law, v. 19 (2014). Trevor Keck, Military Law Review (v. 211, 2012). Monika Hlavkova, Journal of Conflict and Security Law, v. 19 (2014). G. Corn and C. Jenks, U. of Penn. Journal of International Law, v. 33, 2011. The use of drones in war and armed conflict also falls under several broader topics covered in this section of the guide, including asymmetrical warfare, evolving nature of warfare, and extraterritorial use of lethal force. However, there has been a significant amount scholarship generated in the last few years specifically discussing legal issues surrounding the use of drones, robots, and other unmanned devices in armed conflict situations. HOLLIS search: Subject = "Autonomous Robots"
HOLLIS search: Subject = "Drone Aircraft"
HOLLIS search: Subject = "Mobile Robots"
HOLLIS search: Subject = "Uninhabited Combat Aerial Vehicles"
HOLLIS search: Subject = "Vehicles, Remotely Piloted"
Leila Nadya Sadal, Case Western Reserve Journal of International Law (2012-13). A 2011 publication of the Oxford Research Group's Recording of Casualties of Armed Conflict Project. Leila Sadat, Katherine B. Fite Lecture: International Humanitarian Law Dialogs, Studies in Transnational Legal Policy, v. 45 (2012). Michael W. Lewis and Emily Crawford, Georgetown Journal of International Law, v. 44 (2012-13). Alberto R. Gonzales, George Washington Law Review, v. 82 (2013). Frederic Megret, Utah Law Review (2013). Mary Ellen O'Connell, Remarks Delivered at the Sutton Colloquium, Denver Journal of International Law and Policy, v. 39 (2011). Marie Aronsson, Journal on the Use of Froce and International Law, v. 1 (2014). Mary Ellen O'Connell, Journal of Law, Information, and Science, v. 21 (2011-12). Thomas Michael McDonnell, George Washington International Law Review, v. 44 (2012). HOLLIS search: Subject = "Military Art and Science -- Technological Innovations"
HOLLIS search: Subject = "Weapons -- Technological Innovations"
John C. Dehn, Loyola University Chicago School of Law, 2015. Todd C. Huntley and Andrew D. Levitz, Harvard National Security Law Journal, v. 5 (2014). Rosa Brooks, Stanford Law and Policy Review, v. 25 (2014). M Cherif Bassiouni, Journal of Criminal Law and Criminlogy, v. 98 (2008). This broad topic covers multiple concepts, including targeted killings, extraterritorial self-defense (anticipatory/preemptive and otherwise), and state-sponsored acts of extraterritorial terrorism. HOLLIS search: Subject = "Aggression (International Law)"
HOLLIS search: Subject = "Assassination"
HOLLIS search: Subject = "Extraterritoriality"
HOLLIS search: Subject = "Preemptive Attack (Military Science)"
HOLLIS search: Subject = "Targeted Killing"
Precision Strike Warfare and International Intervention: Strategic, Ethico-Legal, and Decisional Implications by Mike Aaronson, Wali Aslam, Tom Dyson and Regina Rauxloh. John Yoo, NYU Law Review (2011). A.J. Radsan and R. Murphy, Journal of National Security Law and Policy (2012). Helen McDermott, Journal on the Use of Force and International Law (2014). Michael N. Schmitt, Columbia Journal of Transnational Law (2011). Ashley S. Deeks, Virginia Journal of International Law (2012). Visit the TRELLO BOARD for this topic. Review the PILAC Resource: Indefinite War: Unsettled International Law on the End of Armed Conflict. Chapter VII½: Is Jus Post Bellum Possible? Antonia Chayes, European Journal of International Law, v. 24 (2013). Gabriella Blum, European Journal of International Law, v. 24 (2013). Michael Jefferson Adams, Harvard National Security Journal (2014). George M. Clifford III, Journal of Military Ethics, v. 11 (2012). Transcript of a conversation on this topic at the 2012 ASIL proceedings. Carsten Stahn, American University International Law Review (2008). Larry May, European Journal of International Law, v. 24 (2013). Gabriella Blum and David Luban, Ethics, v. 125, no. 3 (Apr. 2015). W. Chadwick Austin and Antony Barone Kolenc, Vanderbilt Journal of Transnational Law (2006). Review the PILAC Legal Briefing - Medical Care in Armed Conflict: IHL and State Responses to Terrorism. 1. There is a Library of Congress subject heading that relates to this topic: War -- Health Aspects. When searching for items in HOLLIS+, you can enter this as a subject keyword. 2. The literature on this topic discusses "public health" generally rather than "medical assistance" specifically. In addition, "war" tends to be used more frequently than "armed conflict." 3. Literature that focuses on women's/children's rights in armed conflict often includes a sub-discussion of the provision of specific healthcare services for them. Includes "Doctors in arms: exploring the legal and ethical position of military medical personnel in armed conflicts" by Brigit Toebes. Includes a chapter on armed conflict. Includes several chapters discussing medical treatment and neutrality during times of war and armed conflict. Prepared by the National Defense Research Institute for the Office of the Secretary of Defense. Discusses themes on this topic from ancient times to the present, and how to move forward from here. Includes several chapters on legal and ethical issues surrounding medical neutrality. CJL Murray et al., BMJ, Feb. 9, 2002. This supplement issue includes a number of articles outlining the issues facing medical response and treatment in the event of natural and man-made disasters. J. Marks, Seton Hall Law Review (2007). P.B. Spiegel et al., The Lancet, v. 357 (23-29 Jan., 2010). H.A. Ghobarah et al., Social Science and Medicine (Aug. 2004). L. Rubenstein and M. Bittle, The Lancet, v. 375 (23-29 Jan. 2010). L. Hathout, Philosophy, Ethics, and Humanities in Medicine (2012). According to the ICRC, a "non-international armed conflict" (NIAC) are those conflicts "between governmental forces and non-governmental armed groups, or between such groups only." Specific characteristics of an NIAC are further defined in the ICRC Opinion Paper on Armed Conflict (PDF). International Law Studies, v. 88. Veronika Bílková, International and Comparative Law Quarterly, v. 63 (2014). M. Schmitt, Military Law and the Law of War Review, v. 53 (2013). Sasha Radin, International Law Studies Series v. 89 (2013). Yearbook of International Humanitarian Law (2006). Networks in Non-International Armed Conflicts: Crossing Borders and Defining "Organized Armed Group"
Peter Margulies, International Law Studies Series v. 89 (2013). D. Kristsiotis, Israel Law Review, v.43 (2010). G. Corn and C. Jenks, U of Pennsylvania Journal of International Law, v. 33 (2011). Survey of the role of national courts in five countries in developing IHL: United Kingdom, United States, Canada, Italy, and Israel. Lt. Col. Walter E. Narramore, Army Lawyer, Oct. 2015. Andre Nollkaemper, International and Comparative Law Quarterly (v. 52, 2003). Tom Ruys, Journal on the Use of Force and International Law, v. 1 (2014). Louise Arimatsu, International Law Studies Series, v. 89 (2013). Carsten Hoppe, European Journal of International Law, v. 19 (2008). Frits Kalshoven, International and Comparative Law Quarterly (v. 40, 1991). This section includes links to additional materials that may be helpful for the research conducted by PILAC, such as relevant blogs, other institutes involved in similar work, and IHL scholars. If your research involves United Nations documents and materials, check out the links in this section to the UN Library's research guides. To suggest additional topics for this section of the guide, please contact Jennifer. Armed conflict posts from the blog of the European Journal of International Law. Blog published by IHL legal advisors and officers of the American Red Cross. Online forum on f U.S. national security law and policy, based at the Center for Human Rights and Global Justice at New York University School of Law. Blog authors: Travis Normand and Jessica Poarch Hernandez. Focuses on the interaction between national security-related actions and laws and legal institutions in the United States. Professor Jens David Ohlin's (Cornell Law) blog on international criminal law and law of war/armed conflict. Forum for debate by legal scholars on international law and relations; includes many posts discussing IHL and law of war/armed conflict. Dutch blogger who studies and maps Jihadist conflicts around the world. Medium.com's blog on foreign affairs and defense. Blog hosted by the Georgetown Law Center on National Security and the Law. "From drones to AKs, high technology to low politics, exploring how and why we fight above, on, and below an angry world." Includes online data aggregator services for armed conflict data. Professor Wimmer's (Princeton University) datasets on armed conflicts and wars. Monitors armed conflicts worldwide, focusing on political, military and humanitarian trends in current conflicts. Freely-available comprehensive public collection of political violence data for developing states, focused primarily in Africa. Data on wars and other armed conflicts around the globe. Systematic accumulation of scientific knowledge about war, presented as datasets available for download. Contains data for more than 200 country units, dated 1815-2007. Data on 409 assassination attempts, perpetrated between 1948 and 1967 in 84 countries. Datasets from the International Conflict Research Department at the Eidgenössische Technische Hochschule in Zürich, Switzerland, focusing on conflicts involving ethnic groups. Includes an overview of war crimes and data. Primary data collections from the International Crisis Behavior Project (ICB) from the University of Maryland. The newest release of these data (version 10, July 2010) contains information on 455 international crises, 35 protracted conflicts, and 1000 crisis actors from the end of World War I through 2007. Directory of datasets that provide data on war and armed conflict. Research project that monitors and analyzes the status and conflicts of politically-active communal groups in all countries with a current population of at least 500,000. Since 1959, PRIO has served as an independent research institution for multidisciplinary research in the driving forces and consequences of violent conflict. The Uppsala Conflict Data Program (UCDP) offers a number of datasets on organised violence and peacemaking, most of which are updated on an annual basis. A convenient way to browse UCDP data by region is to use the maps provided in the online UCDP Conflict Encyclopedia (linked to on this page). OUP yearly publication that includes statistical data on the year's wars and armed conflicts. Available through the above link as an eBook. Check out these resources for additional information about war and armed conflict datasets and using them for your research. Nils Petter Gleditsch et al., Journal of Peace Research, 2002. Discusses the Correlates of War (COW) and Uppsala datasets. I. Salehyan, Journal of Peace Research, v. 52 2015. Print resource, Harvard Depository. This is the published proceedings of a NATO research workshop. It discusses various types of databases that relate to PILAC research topics. Kristian Skrede Gleditsch et al., Journal of Peace Research, 2013. Highlights how efforts to collect systematic data on conflict have helped foster progress in peace and conflict research. Joakim Kruetz, Journal of Peace Research, 2010. This article describes introduction of data on when armed conflicts started and ended between 1946 and 2005. This data is part of the UCPD data collection. A. Wimmer and B. Min, International Interactions, v. 35, 2009. K. Gleditsch, International Interactions, v. 30, 2004. This is the most recent edition of the codebook for the UCDP/PRIO Armed Conflict Dataset. This section lists miscellaneous collections of digitized documents that may be useful for PILAC research projects. Includes, but not limited to: ICC documents, preparatory works, statute amendments; international legal instruments; international law decisions and documents; human rights law decisions and documents; publications (including law of armed conflict, UN, ICRC); UN War Crimes Commission documents. Includes case law from the U.S. services' courts of criminal appeals, the U.S. Court of Appeals for the Armed Forces, and the U.S. Court of Military Commission Review. WL credentials required. Digitized collection of primary sources and other documents from the holdings of the U.S. Army Judge Advocate General's Legal Center & School Library. List of the 300+ documents in this collection on "use of force, war, peace and neutrality." Devoted to interdisciplinary study of war and armed conflict. This program from Uppsala University in Sweden has provided research data and courses in peace and conflict studies since 1971. Provides instruction and training, and conducts research, in international law relating to situations of armed conflicts. Geneva Call is anon-governmental organization dedicated to promoting respect by armed non-State actors (ANSAs) for international humanitarian norms in armed conflict and other situations of violence. The IISS was founded in the UK in 1958 with a focus on nuclear deterrence and arms control. Today, it is also renowned for its annual Military Balance assessment of countries' armed forces and for its high-powered security summits. 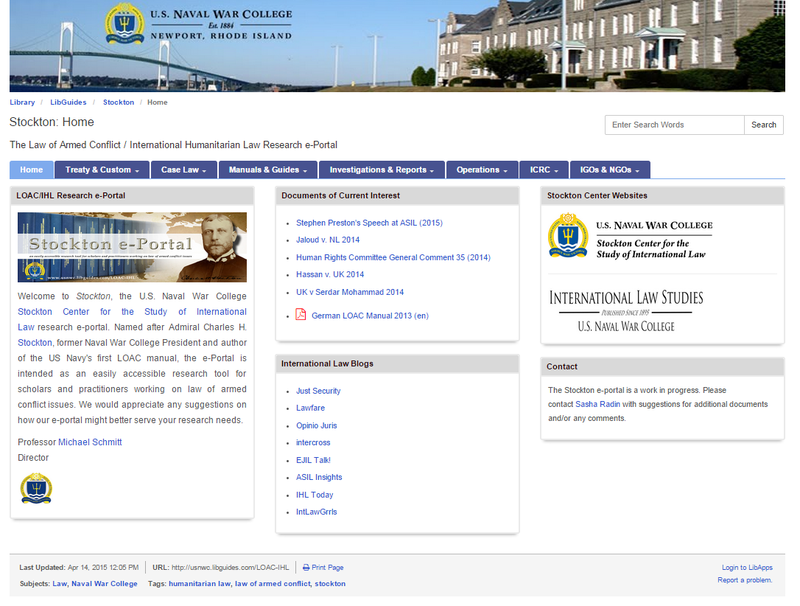 The Harvard Libraries subscribes to the IISS website, which includes its many publications. Click the link above and provide your HUIS credentials. Concerned with problems of war and peace, arms and disarmament, and instances of collective violence. The work of this institute "aims to strengthen law, norms and institutions to restrain, regulate and prevent armed conflict." UK think-tank that analyzes issues related to the resolution of violent conflicts, non-military alternatives to conflict resolution, and sustainable security. Conducts research on the conditions for peaceful relations between states, groups and people. Dedicated to providing research services and information for airpower in support of national security. The U.S. Army War College Library has published a research guide with links to military and government resources, bibliographies, current awareness services, and other items related to the law of war and armed conflict. Independent, federally-funded national security institution devoted to the nonviolent prevention and mitigation of deadly conflict abroad. Brings together governments, humanitarian organizations, people affected by humanitarian crises and new partners including the private sector to propose solutions to our most pressing challenges and set an agenda to keep humanitarian action fit for the future. Use the results in this Google search to find information from the BBC about armed conflicts and wars around the world. 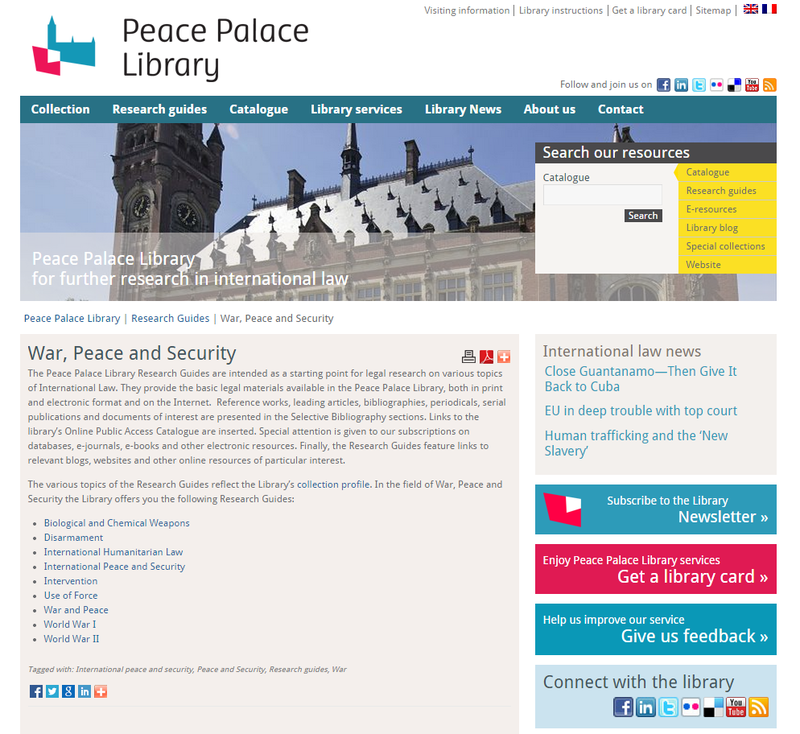 The Peace Palace Library provides research support and services for Peace Palace institutions, including the International Court of Justice, the Permanent Court of Arbitration, and the Hague Academy of International Law. The library has created an extensive collection of research guides, including several that discuss war, peace, and security (shown below, click the graphic to go directly to this page). The Harvard Law School Program on International Law and Armed Conflict (HLS PILAC) set out to collect states’ statements made from August 2011 through November 2016 concerning use of force in relation to Syria. A primary aim of the database is to provide a comparatively broad set of reliable resources regarding states’ perspectives, with a focus on legal parameters. A premise underlying the database is that through careful documentation of diverse approaches, we can better understand those perspectives. The number, range, and scope of intergovernmental entities and initiatives with a counterterrorism component have grown significantly in recent years. Today, a web of counterterrorism laws, policies, and enforcement approaches are developed and overseen by over 70 international institutions, bodies, and networks around the world. These efforts focus on everything from promulgating international legal rules to developing global policy standards, from drafting model criminal laws to promoting intelligence- and information-sharing. To date, the full scope of these efforts has not, to our knowledge, been captured in one place. We set out to identify and summarize these efforts in a single online resource. The surge in armed conflicts involving terrorism has brought to the fore the general question of medical care in armed conflict and the particular legal protections afforded to those providing such care to terrorists. Against this background, PILAC evaluates international humanitarian law (IHL) protections for wartime medical assistance concerning terrorists. Through that lens, they expose gaps and weaknesses in IHL. They also examine tensions between IHL and state responses to terrorism more broadly. In War-Algorithm Accountability (August 2016), PILAC introduces a new concept—war algorithms—that elevates algorithmically-derived “choices” and “decisions” to a, and perhaps the, central concern regarding technical autonomy in war. They thereby aim to shed light on and recast the discussion regarding “autonomous weapon systems” (AWS). Print encyclopedia available at Widener Library. Geographical encyclopedia of names, descriptions, and characteristics of places in the world. 3-volume print dictionary, available at Widener library. 2014 2-volume print encyclopedia in the law library collection, call number HV6278 .N49 2014. Lists references to English and French publications on international humanitarian law; published quarterly. Compiled by Madeline Cohen of the City University of New York; published 2012 in the International Journal of Legal Information. Compiled by the U.S. Army Special Operations Command, available in print in the law library collection and online. Includes print and online sources of primary documents and commentary on IHL; hosted by the site for the Jean Pictet IHL competition for law students. Military law materials from the U.S. Army Judge Advocate General's Legal Center & School Library. Includes bibliographies of interest to several areas of PILAC research, including Aggression, Collective Security, Command Responsibility, Cyber Warfare, Direct Participation in Hostilities, Humanitarian Intervention, Nonstate Actors, State Responsibility, Terrorism, Use of Force, and more. Includes many war- and armed conflict-related bibliographies. Comprehensive database on international crimes adjudicated by national, international, and internationalized courts, hosted and maintained by the T.M.C. Asser Instituut in The Hague. 8-volume series of international law cases and claims through the early 1940s; volume 5 discusses armed conflict law cases. Authors: Edoardo E. Artese and Valentin Vitkov. Click the link above to view a list of the IHS Jane's Weapons periodicals held at the Harvard Law Library. Most of these are in print. The worldwide review of political, military and humanitarian trends in current conflicts, compiled by the International Institute for Strategic Studies. 2014 ABA publication; print only in the law library stacks (KZ6462 .I58 2014). Overview of the international rules established by treaties and customs for regulating armed conflict and the use of military force around the world. Includes materials on international law taught to military judge advocates. Updated in 2012. Provides interactive visual representations of patterns in the evolution of militant organizations. Free online resource for research information on belligerents, conflicts, and weapons. There is also a blog. Collection of diverse legal and practical information for Judge Advocates practicing operational law. This is an outstanding research guide on IHL created by the reference librarians at the Bodleian Library at the University of Oxford. Print book published in 2015; available at Widener Library (call number HV6431 .R686 2015). Yearly UN publication, covers legal status and activities of, as well as judicial decisions on questions relating to, the UN and IGOs. DOD court that tries law of war offenses; legal resources include documents, significant court opinions, and a glossary. Below is a list of scholars and academics who teach and research IHL and armed conflict law. Links to websites with biographical information and, when available, bibliographies are provided. Note: Professor Dinstein does not have a faculty page on the Tel Aviv University website; this link is to the Wikipedia page about him, which includes a bibliography of his books and articles. Directory of these materials available through the ICRC website: four conventions, three additional protocols, and annexes. Miscellaneous treaties, documentation from both Hague conferences, and the Geneva Conventions. The documentary history of the preparation of an international agreement is generally known as its Travaux Préparatoires. The resources below can be helpful in finding these materials for international treaties and agreements. An excellent guide to travaux préparatoires research by Jonathan Pratter of the University of Texas law library. It outlines a five-model process for identifying and finding travaux. Describes the ICRC online collection of Geneva Convention preparatory documents and how to access and search it. Available in print in the law library collection, call number K3238.31966 .B67 1987. This is a print resource available in the law library collection, call number KZ7140.A61998 A12 2012. Among this organization's responsibilities is the responsibility to protect populations from certain effects of armed conflict: genocide, war crimes, crimes against humanity, and ethnic cleansing. Discusses basic tools for finding UN documents, and specific information about the daily journal, document symbols, letters, meeting records, official records, presidential statements, press releases, reports, resolutions/decisions, and more. Discusses research methods for UN international law documentation specifically, covering the courts/tribunals, the General Assembly, the Security Council, and the UN Legal Offices. Treaty research is also briefly covered. Provides information about researching UN Security Council documents specifically. Document types covered include meeting records, official records, reports, resolutions, decisions, and presidential statements. Also discusses voting information and working methods. Database comprised of data reported by UN member states on weapons trade and holdings, as well as national weapons policies. Based on military expenditure reports submitted by UN member states. This database provides easy access to jurisprudence emanating from the United Nations Treaty Bodies which receive and consider complaints from individuals: the Human Rights Committee (CCPR), the Committee against Torture (CAT), the Committee on the Elimination of Discrimination against Women (CEDAW), the Committee on the Elimination of Racial Discrimination (CERD), the Committee on the Rights of Persons with Disabilities (CRPD), the Committee on Enforced Disappearances (CED), the Committee on Economic, Social and Cultural Rights (CESCR), and the Committee on the Rights of the Child (CRC). Includes data that was formerly included in the SIM database. Law Library call number K5256.A35 U65x 2006 (Langdell 3rd floor). Presents a complete overview of the UN-activities on the fight against terrorism, including work of the General Assembly, the Security Council, Counter Terrorism Committee and many more organs of the UN. 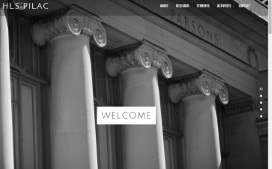 The Stockton e-Portal is a research resource for armed conflict law. It is maintained by Sasha Radin, diector of research at the U.S. Naval War College Stockton Center for the Sutdy of International Law. You may also contact Jennifer directly (contact information is at the top of this page).